Fourteen years ago, Mr. 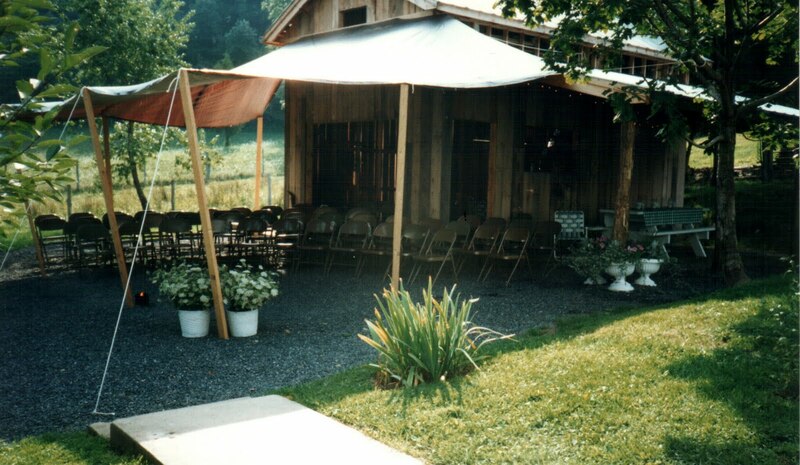 Handsome and I got married in my parents’ driveway under a black tarp, buckets of Queen Anne’s Lace at our feet, with fifty-some guests all comfy on metal folding chairs watching on. I hadn’t wanted to marry him that morning. He had arrived the day before in his little red Toyota Celica (we promptly dashed to the courthouse to sign the marriage papers, last minute for everything as was—and is—our custom) and then busied himself stringing lights around the garage/barn (that he had helped pour the floor for on his first visit to my house the last summer). But come Saturday morning of August 24, 1996, I decided I didn’t even really like the guy. I don’t remember what my last minute funk stemmed from. Perhaps he was acting overly goofy or arguing with me just for the heck of it. Whatever it was, I was suddenly excruciatingly aware that I’d be stuck with him (and his behavior) for the rest of my blessed life and I just wasn’t in the mood for it. But I knew I had made the decision to marry him in less stressful times, so I soldiered on, ever the martyr. And really, it wasn’t serious doubts I was having. I just didn’t, at that time, really, you know, like him. By the time the wedding started, I liked him again. We ate supper first, guests spilling over onto both porches and the yard, and then there were pictures and last-minute vow memorization. The service itself was simple—some scripture, some readings, a meditation, the vows, a few tears, and then a fierce hug as the sun went down. Homemade ice cream and cookies followed. In the bathroom, my brothers' idea of a joke. My mother was so organized that come the day of the wedding, we all sat around bored. That was just page one. Page two was a map of the kitchen with lines and arrows indicating traffic flow, as well as a diagram of the kitchen table showing how the food was to be arranged. Keep door to back porch shut as much as possible or guests will think they’re in West Virginia. Mr. Handsome and I, we are so totally different. Sometimes it blows me away how different we are. I always thought I’d marry a studious man, a guy who liked to sit around in the evening and discuss esoteric theology, whatever that is. Instead, I got a tool belt-wielding, calloused-handed, down-to-earth, sharp-tongued manly-man. With emphasis on manly, as in manly-man. I have no problem with how things turned out. Still, being so different and all, it can be pretty hard to find stuff to do together on special occasions like, say, our anniversary. Long pause, in which I think about childcare possibilities, movies, special food to prepare, whether or not we might enjoy going out to dinner, if we should spend the evening cleaning the attic or running the errands.... and Mr. Handsome thinks about the axle on his truck. It's been giving him problems. At least we agree about not having anything to do together. So maybe we’re more alike than we let on? Fourteen years is a long time to live with someone completely different from yourself. Fourteen years means we’ve shared a bed for...let’s see...WHOA! 5110 nights! Taking into account a handful of weekends apart, perhaps it's only 5000 nights, but still, five thousand nights is a lot of nights. That means there have also been 5000 days and 5000 suppers. How about dirty supper dishes? With a super-low estimate of 35 dirty dishes, that would be 175,000 dirty supper dishes. Suddenly I feel very tired. Fourteen years ago, I married this man. Despite our differences and the sometimes disheartening lack of shared interests, we have done an awful lot of together-living. Speaking of cereal, Mr. Handsome brought me home a box of Captain Crunch today. We have a thing for it. Loverly, loverly. You're some of our favorite people. What an awesome post! I laughed out loud at parts. And it takes a lot to make me laugh out loud. I can so relate to your description of the type of man you THOUGHT you would marry as opposed to who you actually married. It is the same with my husband and I. He and I are soooo different! That's so fantastic. It's funny how opposites attract, isn't it? 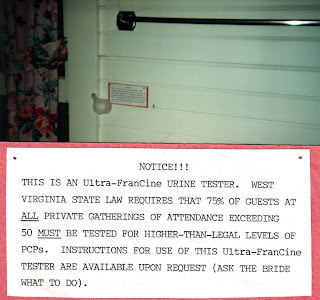 I remember that wedding and the page of instructions and how we sneaked around the back to view the wedding since we were only invited to work. It was a beautiful wedding - Congratulations! Congratulations! I think your anniversary plans sound great and I might suggest the very same to my husband for our anniversary on Saturday (I already scored the free childcare). I adored reading your mother's lists (of course) and hearing about your wedding. I always love a good story, especially a wedding. You guys were wonderful! I am soooo glad you sneaked out around the raspberries to watch the wedding. That the workers would want to see the ceremony was the one thing that we (or rather, my mother, seeing as I was pretty much totally self-absorbed) all over-looked. Great post. 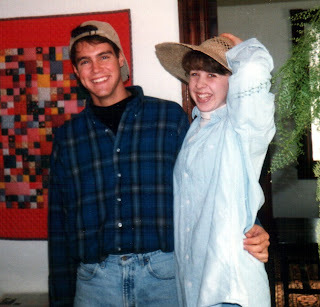 Happy Anniversary, you two:-). I remember that day. Lots of emotions going on. I'd just come back from falling in love with being a wilderness instructor in Northern Minnesota, BWCA. And by the way, whenever I see your initials I think "OCD" and it cracks me up. Why are you not more popular than Pioneer Woman? You should be. Excellent post(s). Happy anniversary! Half Assed, The only thing separating me from PW is a couple thousand head of cattle, long auburn locks, a Basset Hound, and an everlastingly sunny disposition. Aside from those things, we're EXACTLY alike. And you forgot to mention the part about the husband who is right at your elbow in some of the toughest moments of life (and death), loving you, loving your children, and letting his stillness serve as respite for all the swirling. 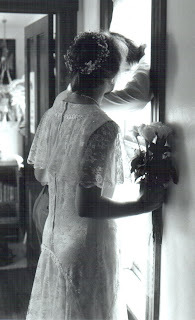 Happy Anniversary -and many more.